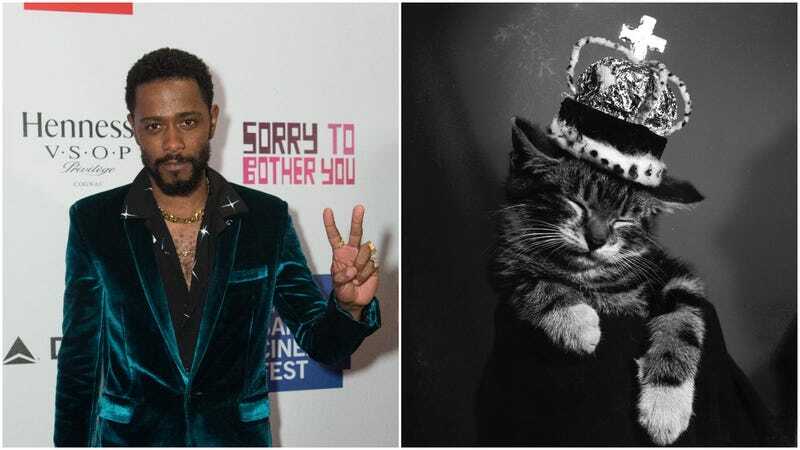 Lakeith Stanfield is having a damn good year; he currently stars in Boots Riley’s Sorry To Bother You, one of the most imaginative gut punches in recent cinematic memory, and continues to put in stand-out work on the critically beloved Atlanta. Stanfield’s already got a few upcoming projects on his roster—including The Girl In The Spider’s Web—but now he’s being upgraded to cinematic royalty, with Deadline reporting that Stanfield will soon be playing…The Prince Of Cats. What do you mean, “Prince Of Cats is actually a well-regarded graphic novel by Ron Wimberly, originally published 2012 by Vertigo, and telling an ’80s hip-hop take on Romeo & Juliet; the book is centered on the character of Juliet’s violence-prone cousin Tybalt, described in the original Shakespeare with the ‘Prince Of Cats’ title, meaning that no one involved in the actual project will actually be any kind of talking cat”? Anyway, Legendary just won a bidding war for the rights to the celebrated graphic novel, with an eye toward casting Stanfield in the starring role. Selwyn Sefyu Hinds, who also recently adapted Nnedi Okrafor’s Who Fears Death for HBO, is adapting the book to the screen, all of which feels like a pretty great marriage of talent and subject matter, no matter how much it might hurt our dreams of feline conquest to admit.